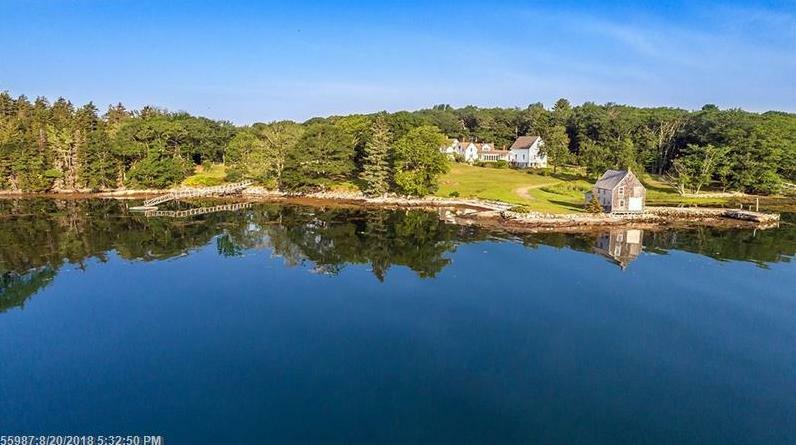 This historic saltwater farm is ideally located on the protected waters of Jones Cove with southerly views to the Atlantic Ocean. The 7.8+/--acre property encompasses rolling fields, mature forest, 1,800+/- feet of water frontage with a beach, deep-water pier for boating needs and a 100' stone pier with a boathouse at the water's edge. The 4-bedroom home with attached 3-story barn enjoys elevated views over the fields to the anchorage. There is also a separate 3-story carriage house for cars/storage possible studio and horses. Minutes from Christmas Cove and the numerous amenities of nearby coastal villages. 48 Jones Point Road (MLS #1366939) is a greek-revival single family home located in South Bristol, ME. This single family home is 3,368 sqft and on a lot of 339,768 sqft (or 7.80 acres) with 4 bedrooms, 2 baths and is 153 years old. This property was listed on 12/07/2018 and has been priced for sale at $2,350,000. Nearby zip codes are 04537, 04538, 04544, 04554 and 04573. This property neighbors other cities such as Boothbay, Boothbay Harbor, Bristol, Edgecomb and Southport.